In the Gunma prefecture of Japan there sits an elaborate statue of the Buddha housed within a community hall. From a distance the intricate statue seems to be covered with thousands of gems and jewels… until a closer look reveals that it is actually composed of tens of thousands of dead insects! The statue took the artist over 6 years to create, and while it might be the creepiest religious icon we’ve ever seen, we admire the artist’s incredible use of natural, biodegradable materials. Inamura Yoneiji, a 89-year-old local of the area, created the statue in tribute to the souls of the insects, most of which are beetles. Talking about the statue, Yoneiji says “For children in the years immediately after World War II, Japan was poor and there was little entertainment available, aside from catching bugs. However, every bug would eventually die after being caught. By making a statue of a Buddha from their dead bodies, perhaps their souls can rest in peace.” And how much more peaceful could a statue of Buddha get, with the bodies of bugs extended into a new life to pay homage to Buddha. It's actually a statue of a Bodhisattva (not a Buddha), but thanks very much for sharing this with us! In the Gunma prefecture of Japan there sits an elaborate statue of the Buddha housed within a community hall. 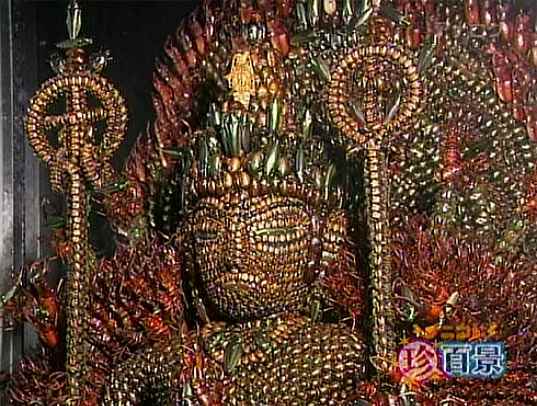 From a distance the intricate statue seems to be covered with thousands of gems and jewels... until a closer look reveals that it is actually composed of tens of thousands of dead insects! The statue took the artist over 6 years to create, and while it might be the creepiest religious icon we've ever seen, we admire the artist's incredible use of natural, biodegradable materials.